International Environmental Law and Sustainable Development: Past Achievements and Future Challenges is a collection of essays that cover some of the most important contemporary issues in contemporary law relating to sustainable development, the utilization of natural resources, and the protection of the environment. Written by well-known experts on these topics who include judges of the International Court of Justice and the International Tribunal for the Law of the Sea; legal advisers from international organizations such as the World Bank, the International Maritime Organization, and the Food and Agriculture Organization; and practitioners of international law, as well as some of the leading scholars writing on international environmental law and related subjects this book covers many of the major legal developments that have taken place since the United Nations Conference on Environmental Development held in Rio de Janeiro in 1992. 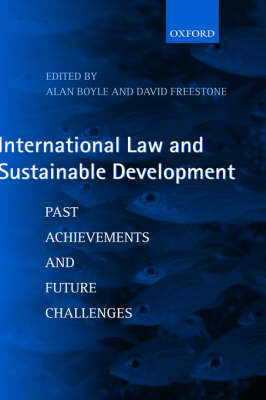 The contributors bring new perspectives on sustainable development as a legal principle, the role of the International Law Commission in codifying international environmental law, the protection of the marine environment following the entry into force of the 1982 UN Convention of the Law of the Sea, and the revolution in international fisheries law. The editors have ensured that the book covers a wide range of topics from Antarctica to small whales and the book will be of particular interest to those teaching or practising law of the sea and international environmental law.